Zumag Sisa i Tena, Ecuador: Reservér nu! 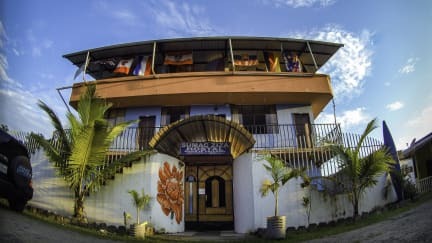 Our hostel has a large, breezy chill-out area on our terrace with hammocks and beautiful views over the city and the mountains in the distance. We offer spacious single and double rooms and dorms, all with private bathrooms and fans. We have a spacious kitchen, a barbecue area, two dining rooms, Wi-Fi and safe parking. Mobile homes are also welcome. Just a short bus ride away from our hostel you can find lagoons and waterfalls, green rivers, visit the Quechua’s ethnic groups, or try rafting (Tena is considered one of the best rafting destinations in South America). We encourage you to also enjoy the food of the region, or the nightlife in the city, which is especially nice on the weekends. Tena is a gathering point for tourists who want to enjoy the Amazon region of Ecuador. You can reachTena in only 3 hours by bus from Baños or in 4 hours from Quito. Check in from 1.00 PM. Breakfast not included - available for 3 USD per person per day.